You always have a choice. Always. Sometimes we might not like our choices. Sometimes we might not see any options. Yet the truth is that there is always a choice. 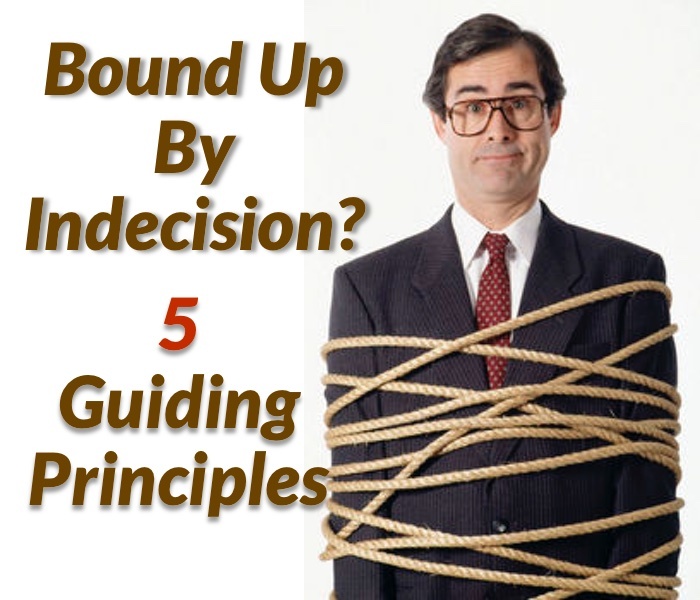 What is needed is some sharp thinking to cut through the ropes that have bound you up in indecision. So what brings about that sharp thinking? Usually they are questions that we need to ask ourselves and evaluate our situation. The trouble is that when we are in the tightening grip of the ropes that bind us we feel like we are getting weaker and weaker. We seem to be running out of oxygen and we just have too little strength. So we swallow hard and often times settle or give in to what we’ve always done or what we instinctively know is not the best thing. But how do we address that? 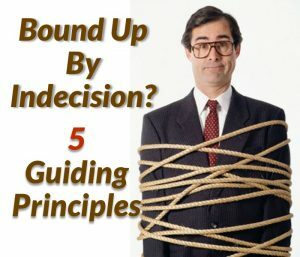 Here are four questions that you can ask yourself so that you can cut free from the ropes that are strangling you in indecision. 1. What are you really trying to accomplish? This is the 40,000 foot view. It is the big picture question. Sometimes we just get so caught up in the day to day demands and the multitude of things coming at us that we lose the forest for the trees. Backing up and asking this question puts us back to looking at why we are doing what we are doing in the first place. It has a way of refocussing our perspective on what is most important. It will often cut through the cords that seem to be at odds in our current situation that makes us feel like our hands are tied. For example, reminding ourselves that the real goal of our ministry is to bring people closer to Jesus will give us courage and clarity to say no to that pet activity that has distracted some people. With this fresh perspective it will help us not only to say no but to be able to explain it and redirect their thoughts toward a higher goal than to just gather the faithful for another with another event. 2. Where are you now? This is the reality check that asks you to admit that things are not as bad or as good as you think they are. Having clarified where you are going it is now important to acknowledge were you are or define your starting line. This is where you admit that your people are way more interested in gathering as a club than as a mission agency. They would rather enjoy the fellowship than set aside their own wants and needs and preferences for those who are far away from Jesus like Paul described in 1 Cor 9:19-23. Admitting your starting line will enable you to dig into the next question. 3. What should you do? This is the question that takes gets you thinking beyond the normal budget and calendar and “to do” list for the church. So often we just repeat what we did last year regardless of whether or not what we did last year got us any closer to accomplishing what we are really trying to do (see #1 above). If we are clear about what we are trying to accomplish and honest about where we really are, then we can face our “to do” list with fresh eyes or at least have more focus on things that will more likely get us there. Note: we are not talking about changing the call for word and sacrament ministry. Those are “standard menu items” that are staples or foundational for our ministry. What we are talking about here is the program of the church. What should you really do if you are serious about moving from where you are to where you want to be by God’s grace? 4. What will you do and when will you do it? This question moves you from the idea stage to the planning stage to the doing it stage. We like to talk and talk and talk. That’s safe. This moves us to actually doing something. That’s scary but it should also be seen as positive no matter the outcome. Who, what, when, how, how much are all related powerful questions. 5. What did you learn? This is the ever important after event review. Did it help you move closer to what you are really trying to accomplish? Why or why not? What actually happened? How much, how many? What do you need to keep and what do you need to change? The feedback loop or the action - learning loop it critical. We need to avoid the temptation to move on to the next activity. Pause to evaluate, to learn, to celebrate. Work through these five questions regularly and soon you will see real progress or movement with your ministry and a lot less being bound up with few options. "Helping leaders be more productive - less controlling"
The International Coach Federation video gives a nice introduction to coaching and who might benefit from it. Coaching Demo Composite from C Scott Gress on Vimeo. Watch this short video for a better understanding of what coaching is really about. Coaching Defined from Rev. Scott Gress ACC on Vimeo.